If you are known for having a sweet tooth, then this product is for you. Once used for cooking cane syrup and making sugar, cast iron syrup kettles are finding new life as planters, fountains and fire pits in gardens across the country. However you choose to use them, these antique relics will add a touch of Southern history to your landscape. While most people can agree with the statement that everything is better covered in chocolate, this designer's mantra is that everything is better covered in turf. 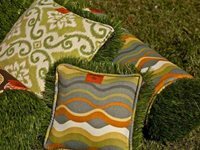 Her products use synthetic turf in a playful fashion that bridges both indoors and out, as well as nature and comfort. It's the little things that make a house a home. The same goes for a porch, patio or outdoor living area. Adding comfortable, decorative textiles will make the space feel more inviting. However, you can't just use ordinary throws, rugs or pillows - they'll need to be ones that can hold up to outdoor conditions. 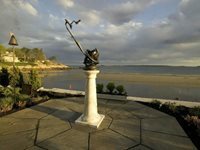 Serving as both a sculpture and a powerful telescope, the garden telescope provides a truly distinctive landscape design centerpiece. The telescopes, which sit atop a marble pedestal, are a 1920s design with improved 21st century optics. 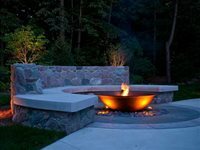 PCO Design offers custom outdoor furniture, containers, architectural structures, sculptures, fountains and other unique garden elements. Their designs have a modern vibe that would perfectly complement a mid-century inspired landscape. 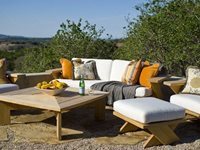 Check with the Austin, TX based company to see if they do work in your area. 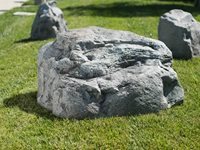 Artificialrocksfactory.com offers the most realistic faux rocks and boulders. 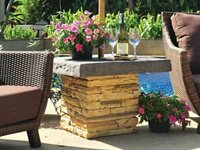 Their products come in three types: DuraRock covers, Polyurethane rock covers and cast stone rocks. You can choose from a variety of sizes, shapes and colors. Their rock covers are great for hiding a pond pump or utility hook ups, while the cast stone rocks are great for beautifying residential landscapes without having to struggle with the extreme weight of real rock. This umbrella stand, which also doubles as a table is the perfect size for even the smallest of patios. With this table stand you'll have shade and a place to set your drink. Made of cast stone, the stand has the texture and feel of real stone. The base is designed to look like stacked stone and comes in gray or beige. If needed, the stand can be weighted with sand to keep it from tipping in the wind. 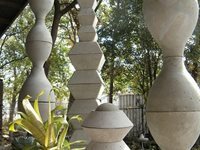 Terra Sculpture offers modern outdoor sculptures that will turn any garden into a gallery. 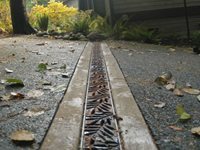 Each of their pieces is designed specifically for use in residential landscapes. They are made of powder coated steel, stainless steel and weather coated steel. Designed by a former landscape architect, the sculptures explore "the bold impact of shape, texture and color within organic surroundings". 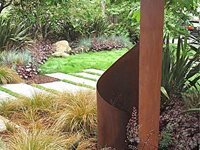 One of Terra Sculpture's pieces of art will provide a unique focal point for a cutting edge garden.